Washington, DC — Black women face a disproportionate share of fatal domestic violence in America, according to the new Violence Policy Center (VPC) report When Men Murder Women: An Analysis of 2011 Homicide Data. In 2011, 492 black females were murdered by males at a rate of 2.61 per 100,000, compared to a rate of 0.99 per 100,000 for white females. The annual report is released to coincide with Domestic Violence Awareness Month in October. The study covers homicides involving one female murder victim and one male offender, and uses data from the Federal Bureau of Investigation’s unpublished Supplementary Homicide Report. This year’s report applies to 2011, the most recent year for which data is available. • Where the relationship could be determined, 94 percent of black females killed by males knew their killers. Nearly 15 times as many black females were murdered by a male they knew than were killed by male strangers. • Of the black victims who knew their offenders, 52 percent were wives, common-law wives, ex-wives, or girlfriends of the offenders. Ninety-three percent of the homicides were intra-racial. • Firearms, especially handguns, were the most common weapons used by males to murder black females. When the murder weapon could be identified, 51 percent of black female victims were shot and killed with guns. Within that group, 82 percent were killed with a handgun. • In homicides where the age of victims was reported, 12 percent of black female victims were less than 18 years old (55 victims), and five percent were 65 years of age or older (22 victims). • The vast majority of homicides of black females murdered by males were not related to any other felony crime. Most often, black females were killed by males in the course of an argument. In cases where the circumstances could be identified, 87 percent were not related to the commission of any other felony. Nationwide, a total of 1,707 females were murdered by males in single victim/single offender incidents in 2011, at a rate of 1.17 per 100,000. 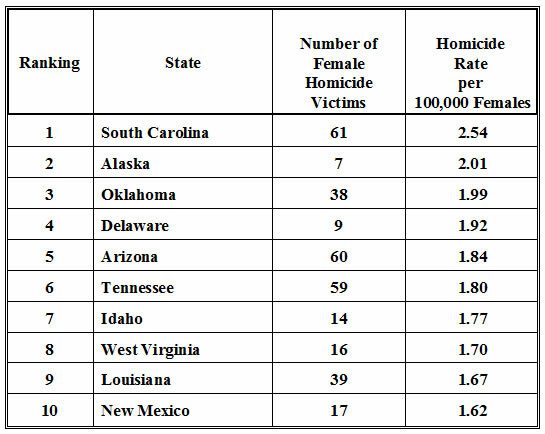 The study also ranks each state based on the homicide rate for females murdered by males. In 2011, South Carolina led the nation with a rate of 2.54 per 100,000. Please view the full report to find additional details on the study, including data on the murder of black females. To view the full report, please visit vpc.org/studies/wmmw2013.pdf. Much like Mothers Against Drunk Driving was created to change laws regarding drunk driving, Moms Demand Action for Gun Sense in America was created to build support for common-sense gun reforms. The nonpartisan grassroots movement of American mothers is demanding new and stronger solutions to lax gun laws and loopholes that jeopardize the safety of our children and families. In just nine months, the organization has more than 100,000 members with a chapter in every state in the country. For more information or to get involved visit www.momsdemandaction.org. Follow us on Facebook at www.facebook.com/MomsDemandAction or on Twitter @MomsDemand.